It’s been a long time since I’ve seen so much activity in the retail ice cream freezer. This is likely the result of numerous start-ups gaining notoriety and the big players defending their space. The dynamics are quite polarizing, with many players participating in both extremes. This includes private label, which is not the norm, like so many things in the world these days. Take Albertsons Companies, for example. This retail giant rolled out two private label brands this summer, participating in the top-three trends. Albertsons’ Signature Reserve is a new top-shelf culinary presence for the retailer. The brand is intended for life’s special and indulgent moments, offering unparalleled quality and exquisite taste for customers who are obsessed with the exceptional. The initial launch of Signature Reserve is seven decadent flavors of ice cream, all featuring globally sourced ingredients that are perfect for entertaining or everyday indulgence. Flavors include Brazilian Guava Cheesecake, Madagascar Vanilla, Colombian Cold Brew Caramel, Bourbon Maple Blondie, Indian Cardamom Pistachio, Caramel Apple Chai and Belgian Chocolate Almond. 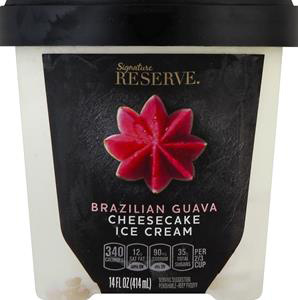 These ice creams are available now at Albertsons Companies stores, including the namesake Albertsons, Jewel-Osco and Safeway. The company plans to introduce additional new Signature Reserve products in other categories throughout 2018, including ultra-premium pasta and pasta sauces imported from Italy, single-origin packaged coffees from Sumatra and Nicaragua, and four varieties of hand-picked loose leaf tea. Albertsons has also rolled out Open Nature Scandal-less Ice Cream. It’s a high-protein ice cream with 67% less fat and 45% fewer calories than regular ice cream. The product relies on a sweetener blend of stevia, cane sugar and erythritol. Because this is under the Open Nature brand, shoppers are assured that only natural ingredients are used to make the ice cream. The new Open Nature Scandal Less Ice Cream comes in seven flavors all under 380 calories per pint. They are: Chocolate Mocha Chip, Cookies and Cream, Cookie Dough, Mint Chip, Peanut Butter Cup, Sea-Salt Caramel and Vanilla. This is an interesting category and it will be interesting to see how the numbers play out at the end of the year, as there are way too many players. That’s right, you read it here first. Ice cream marketers looked at retail scanner data from 2017 and saw that the few players in the high-protein, low-sugar segment—one in particular--were doing quite well. What they did not know is that retail sales data shows the scan, not the discount. Many of these products were on “buy-one-get-one free” deals most of 2017. One of the more notable brands issued “one free pint, no purchase necessary” coupons at the register every time you made a purchase as select grocers. I personally received seven free pint coupons last August. Albertsons also has its Open Nature brand participating in the non-dairy frozen dessert segment. These products are made with almonds and cashews.What’s important to note about the trend in non-dairy is that it is being embraced by dairies. 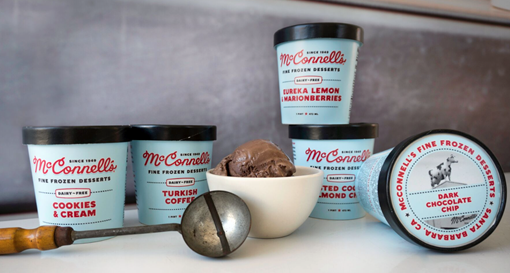 McConnell’s Fine Ice Creams, a 70-year old, family-owned California dairy has entered the growing plant-based food segment. They’ve reinvented everyone’s favorite treat with a line of Dairy-Free Frozen Desserts. Coming up with a product that met McConnell’s high standards was challenging, but after a process that took the better part of a year, McConnell’s co-owner and chef Eva Ein finally arrived at a product that met the criteria. The secret ingredient? Peas, or more specifically, pea protein. 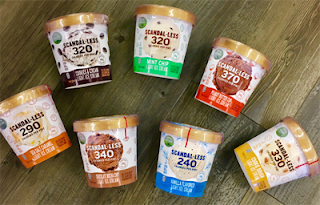 “There’s nothing interesting or innovative about coconut cream, almond or cashew milk, or soy-based ‘ice creams,’” says McConnell’s co-owner and CEO, Ein’s husband, Michael Palmer, referring to the industry’s standard alternatives to dairy-based ice creams. “These are the same products that’ve been out there for years, and the results are rarely worth it.” According to Palmer, it’s difficult to remove the coconut or roasted nut taste from a coconut cream or nut-based product. In attempting to do this, companies typically over-flavor their products, along with pumping these products full of air and stabilizers, which results in chalky, crumbly, inconsistent texture. McConnell’s Dairy-Free Frozen Desserts are made from a proprietary blend (McConnell’s P3) of 100% micronized pea protein. Pea protein is a sustainable protein derived from yellow peas, the very same plant-based protein found in many of the food industry’s cutting-edge vegetarian and dairy-free milk substitutes. The result? McConnell’s Dairy-Free Frozen Desserts line, made from a base that is both neutral in flavor and shares the mouthfeel--and many other characteristics--found in McConnell’s super smooth, 18.5% butterfat ice creams. McConnell’s dairy-free is also lower in fat and sugar, cholesterol-free and non-GMO. “People who crave great ice cream want to taste great ice cream, whether it’s dairy-based or not. The last thing we want to have to do is apologize for giving customers a lesser experience. They shouldn’t have to settle,” says Palmer. The line comes in five flavors. They are: Cookies & Cream, Dark Chocolate Chip, Eureka Lemon & Marionberries, Toasted Coconut Almond Chip and Turkish Coffee. These first three trends are all about better-for-you and indulgence. Remember when ice cream was fun? 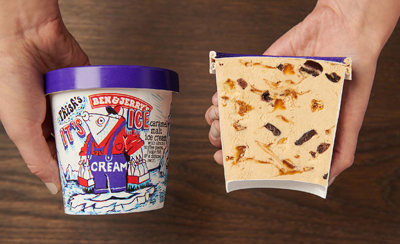 Ben & Jerry’s has managed, for the most part, to remain entertaining. But many other brands, in efforts to be simpler and more natural, have stopped being whimsical and lost their kid appeal. Batman’s Dark Knight Brownie Bite is chocolate light ice cream mixed with bat-shaped chocolatey pieces, brownie chunks and fudge swirl. Superman’s Krypton Cookie Dough is cookie dough-flavored light ice cream with red and gold cookie dough pieces and blue sprinkles. Wonder Woman’s Golden Lasso is swirled vanilla- and caramel-flavored light ice cream with star-shaped caramel chips and graham cracker variegate. There are comics on the back of each package. Consumers collect all four comics from each superhero to read an exclusive adventure. 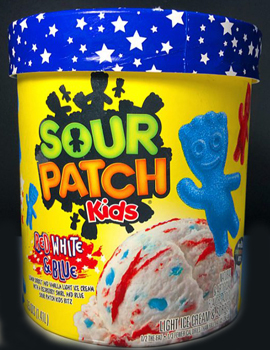 The company is also selling red, white and blue Sour Patch Kids ice cream exclusively through Walmart. The limited-edition product is a mix of lemon sorbet and vanilla ice cream with a red berry swirl and chunks of blue gummy candy. 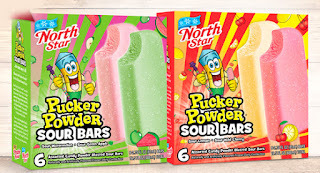 Ice Cream Specialties, a division of Prairie Farms Dairy, now offers North Star Pucker Powder Sour Bars. 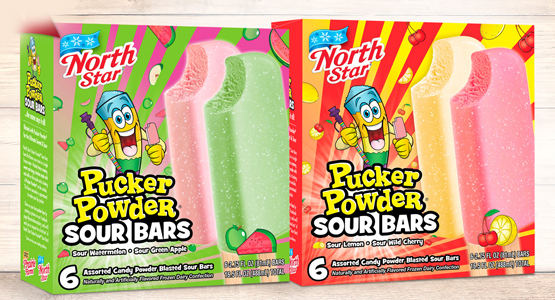 These extreme sour frozen dairy novelties come in Green Apple, Lemon, Watermelon and Wild Cherry flavors. As mentioned, Ben & Jerry’s leads in the fun ice cream segment. The Unilever brand has partnered with the band Phish for a third flavor: It’s Ice…Cream. (Pictured at beginning of blog.) This flavor features caramel malt ice cream with almond toffee pieces, fudge fish and a caramel swirl. It was one of the original flavor concepts in the running, back in 1997, to become Phish Food. Ben & Jerry’s is also introducing three new cookie dough flavors for scoop shops and delivery only. 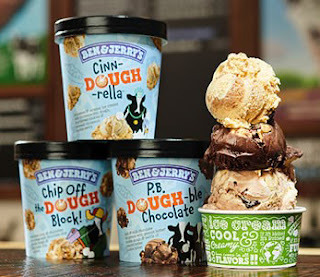 Ben & Jerry’s created the first cookie dough ice cream back in 1984, and now the brand is introducing three new dough-riginal flavors. Off The DOUGH Block! is chocolate chip and chocolate ice cream with chocolate chip cookie dough and chocolate chip cookies. P.B. DOUGHble Chocolate is dark and milk chocolate ice creams with peanut butter cookie dough and swirls of peanut butter cookie butter. Cinn-DOUGH-rella! is cinnamon and caramel ice cream with cinnamon bun dough, shortbread cookies and oatmeal cinnamon cookie swirls. The final trend is as much about the product as it is about the package. A number of companies are giving their ice cream packages makeovers in order to better stand out in what is an extremely crowded retail freezer. Hiland Dairy Foods is introducing three new ice cream flavors of its premium ice cream in new packages that feature crisp graphics with light blue backgrounds. More importantly, Hiland redesigned the packaging in response to consumer and grocer requests for more food label transparency and less packaging waste. 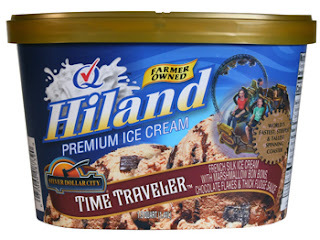 Hiland Time Traveler was inspired by the revolutionary new Time Traveler roller coaster at Silver Dollar City, billed as the world’s fastest, steepest and tallest pinning coaster. The new ice cream flavor features French silk ice cream spun with marshmallow bonbons, chocolate flakes and thick fudge sauce. Caramel Waffle Cone is caramel ice cream with milk chocolate swirls and fudge covered waffle cone pieces. Cherry Chocolate Chunk is cherry-flavored ice cream with pieces of real cherries and chocolate chunks. 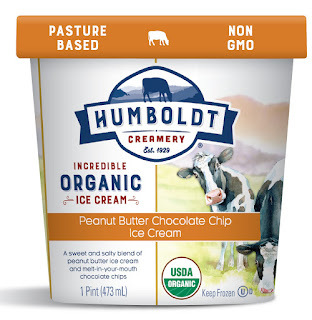 Humboldt Creamery also has a new look with new flavors. The company’s latest organic ice cream flavors are Chocolate Chip Cookie Dough and Peanut Butter Chocolate Chip. The new-and-improved package design features an increased logo for improved identification and a watercolor illustration of the beautiful Humboldt landscape and two grazing dairy cows.